GGWSL's third O50 season will begin summer 2019! Registration will be available closer to the start of the season. To ensure that our O50 has a good foundation and ability for growth, we will once again be accepting over O45's! Over 45's who sign up this summer (or did last summer) will be grandfathered for future seasons! To be eligible you must turn 45 in 2018. Following are more details about our Fabulous O50 division. All games will be played on Sundays, starting on July 1 until August 19. All games will be held at Tom Bates Field - North Turf - Gilman Ave. exit off of hwy 80 (same exit as Golden Gate Fields). Games will consist of 30-45 minute halves (with 5 to 10 minute half time) and played on half a regulation size field. Depending on the total number of participants, we will play small sided games of either 6, 7 or 8 a-side. Team roster maximum will be decided by number of sign ups. Sign ups are done on an individual basis. GGWSL members - those who played either fall 2017 and/or spring 2018 - pay a $55 league fee. Non GGWSL members - those who have never played in the league or did not participated during the 2017/18 season - pay a $75 league fee which includes insurance. 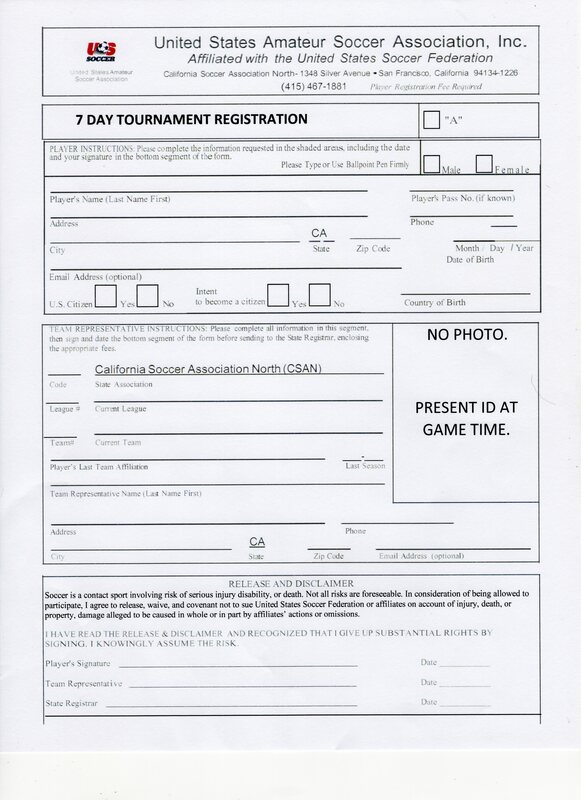 Non GGWSL members will also need to fill out (top box only) and sign the 7 Day Tournament Form. To keep things as easy as possible, we decided to start the league with 4 teams as the Over 35 division did in 2004. The 4 volunteer captains have each selected 2 players for their team. For the sorting of the remaining players, we will be looking at several variables including the players you requested to have as teammates and your self ability evaluation and position preference. These aspects will be taken into consideration to make players as happy as possible with their team placement but also ensure that teams will be competitive with each other. Everyone will get a chance to make new friends! If we have a large number of sign ups, we'll form new teams as necesssary. If you are interested in being a captain, please contact vpnewplayers@ggwsl.org. Captains get their summer league fee waived! Summer 2019 - Registration will open a few months prior to the season. For questions please email registration instructions. PLEASE DO NOT ATTEMPT TO SIGN UP YET. THANK YOU! Go to USER LOGIN (top right corner of any GGWSL.org page) or https://ggwsl.org/LibSys/SysUser.php. Log into your profile by entering your email address and password. If you forgot your password hit RESET PASSWORD. Once you get into your profile look at the right column on the page for MY LEAGUES. Hit the link for PLAYER REGISTRATION. From the PLAYER REGISTRATION PAGE, go to EDIT PROFILE. From the drop down menus update your “Preferred Position” and self-rated “Player Ability”. Hit SUBMIT. You are now back to the PLAYER REGISTRATION PAGE. Hit NEXT. Check the box next to SUMMER, OVER 50 (MEMBER). Hit SUBMIT. From the drop down menu, select the team (or "join any team") Note - we may not be able to accommodate all requests. REGISTRATION IS NOT OPEN. PLEASE EMAIL VPNEWPLAYERS@GGWSL.ORG FOR MORE INFORMATION. THANK YOU! Go to USER LOGIN (top right corner of any GGWSL.org page) or https://ggwsl.org/LibSys/SysUser.php. Hit link to CREATE NEW USER ACCOUNT. Fill in the Login Information, User Information and Address sections on the page. Once done, hit CREATE USER PROFILE at the bottom of the page. From you newly created profile, look at the right column on the page for MY LEAGUES. Hit the link for PLAYER REGISTRATION. Check the box next to SUMMER, OVER 50 (NON MEMBER). Hit SUBMIT. All non members will need to fill out the 7 Day Tournament Registration Form and return to vpnewplayers@ggwsl.org or bring to your first game. This form needs to be filled out (top box only) and signed and dated (bottom box) before you can play. Any female who is 50 or older or who turns 50 during the year of play is eligible. For the two seasons, any over 45 year old that registers will be grandfathered into the division for future seasons. Length of Games: Either Two 30 or 45-minute halves with a 5 to 10-minute halftime. Number of Players: 6- 8 players are allowed on the field for each team, including the goalkeeper. Team rosters must have a minimum of 10 and a maximum of 15-18 players. A minimum of six players are required on the field for an 8 aside team to start and continue a game. 5 players are required for 7 aside and 4 players are required for 6 aside. Substitutions: may be made when the following two conditions are met: the ball is out of play and the referee gives consent. The departing player must be off the field of play before the entering player steps on and the entering player must enter at the midfield line. Uniforms: shin guards are required for all players. Numbered jerseys are required for all players except the goalkeeper. The goalkeeper must wear a different color jersey than all other players. Jerseys must be similar in color for all field players (except for the jersey number). Shorts and socks must be substantially similar in color. Goals: standard size goals and nets will be used. Field Markings: The field will be one half of a regulation soccer field. A reduced size penalty area will be indicated by cones, blue tape stuck to the field or some other distinguishable way. Goalkeeping: After the goalkeeper uses hands to control the ball, an indirect free kick (IFK) will be awarded by the referee to the opposing team if the goalkeeper throws or kicks the ball beyond the mid-field line without the ball first touching a player or the ground. The IFK will be taken from the mid-field line where the ball passed over the line. This rule applies to drop-kicks by the goal keeper. The goal keeper may completely release the ball from his hands to the ground and then play it as any field player may do so (once she does so, she may be challenged as an opponent might challenge any opposing field player). Slide Tackles: slide tackles are prohibited. A direct free kick (DFK) will be awarded to the opposing team that will be taken from the spot of the slide tackle. Goal Kicks: Goal kicks must be taken from anywhere on the goal line within the penalty area. Goal kicks may not pass over the halfway line in the air unless first touched by a player other than the player taking the goal kick. The ball must leave the penalty area in order to be in play. Opposing players may stand anywhere outside the penalty area on a goal kick. Opposing players must be at least 7 yards (as opposed to 10 yards) on free kicks and kickoffs. Penalty Kicks: The penalty spot from which the penalty kick is taken is at the point of the white triangle next to the “20” marked on the field. This is centered on the goal and 12 yards from the goal line. Referees: One USSF certified referee shall be used. Players are expected to honestly assist the referees with regard to balls out of play over the touchlines and the goal lines. No jewelry: Players may not wear any jewelry except for players having a medical condition requiring a medic alert bracelet or medic alert necklace. Medic alert items must be taped to the body.